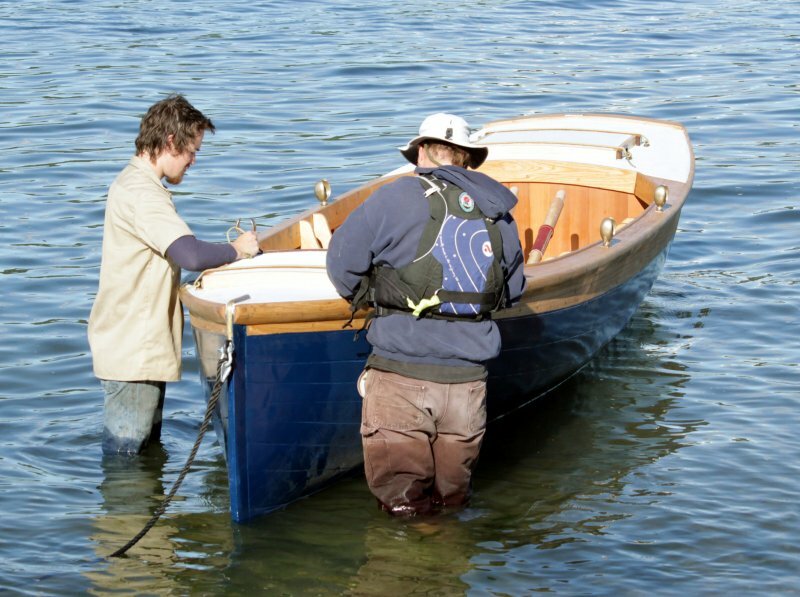 The Northwest School of Wooden Boatbuilding in Port Hadlock launched on June 14, three classic Whitehalls built for the British Broadcasting Corporation. The BBC used the boats in August 2013 to recreate John Wesley Powell’s 1869 exploration of the Colorado River through the Grand Canyon. The School built two 21′ Whitehalls and one 16′ boat. The 21′ boats were built of white oak under the direction of instructor Ben Kahn, while the smaller Whitehall was planked in larch over a white oak backbone and frames under the direction of the School’s senior instructor, Jeff Hammond. The white oak was provided by Newport Nautical Timbers of Newport, Rhode Island. Instructor Ben Kahn accompanied the boats down the Colorado River as a member of the cast, and served as the expedition’s shipwright, maintaining the ruggedly-built boats on a daily basis during the arduous 18-day trip. The boats will be sold by the BBC now that filming is complete. On a side note, one of the two 21′ boats was painted blue and the other one was painted green, while the 16-footer was painted a wine-dark Homeric red at the direction of the BBC’s producer, Cameron Balbirnie. While Powell’s boats were almost certainly painted white, the BBC’s producer felt that the TV audience would find it easier to keep track of the three boats on the river if they were painted different colors.